Philip from the tenors takes us back to the early days of the LGBT choir festival that became Various Voices, with excerpts from former Pinkie Sandy Wilson. 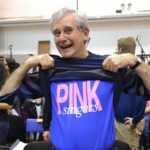 When I joined the Pink Singers in April 1987 there were 20 members (all men) and we had songs like Tom Robinson’s “Glad to Be Gay” and Frankie Goes to Hollywood’s “Relax”. In 1988 two women from New Zealand joined and we finally started to become a proper lesbian and gay choir. 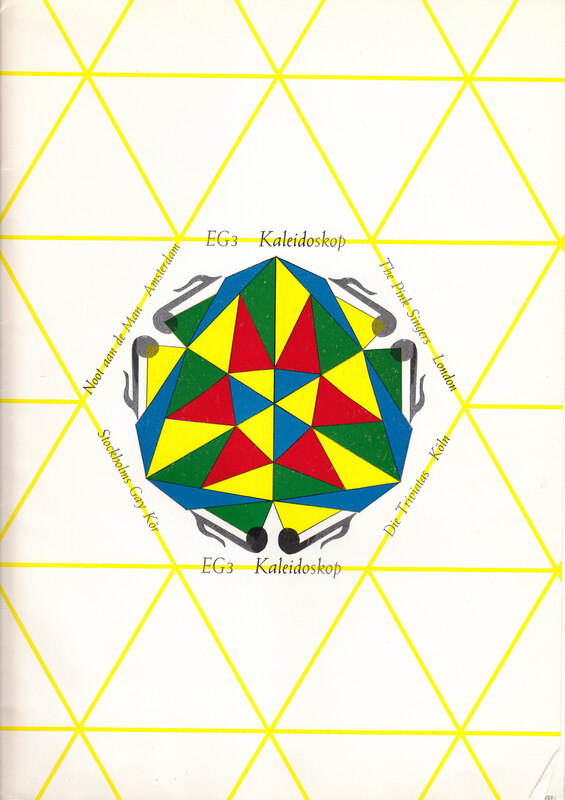 From the beginning the Pinkies forged close links with other European lesbian and gay choirs taking part in the third European Lesbian and Gay Festival of Song in Stockholm (May 1987), and the fourth in Berlin (July 1988). We went off to Skokholm, which was the first time we went to a Festival of Song. […] There were only the Triviatas from Cologne, Noot Aam de Man from Amsterdam, the Stockholm Gay Mens’ Chorus, and the Pink Singers. The next year we went to Berlin – the Kongresshalle. Again there was about 12 or 13 of us and we did a 30 minute set there. In 1988 the UK Government passed Section 28 of the Local Government Act which banned local authorities and schools from “promoting” homosexuality. The European choirs were horrified at this and said ‘Next year, the festival is going to be in London’. 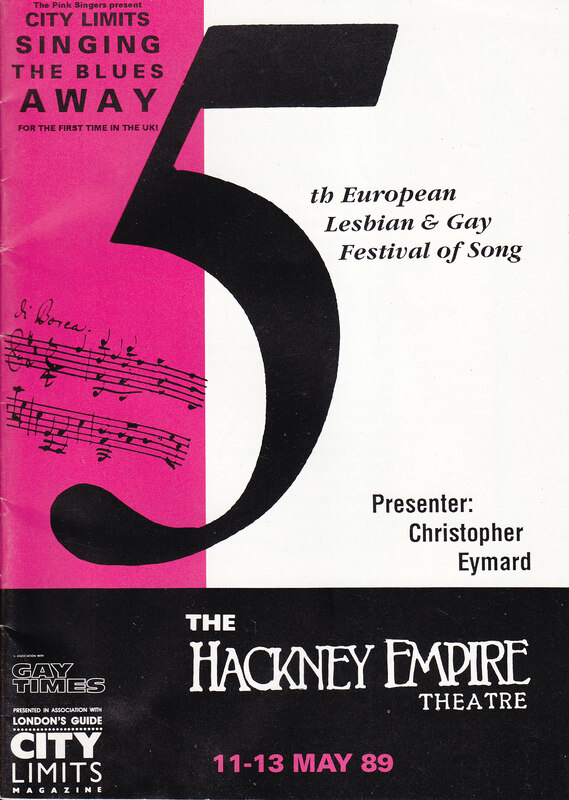 This was a big ask for a small choir like the Pinkies but with the help of the burgeoning LGBT community in London we were able to host the 5th European Festival of Song for three nights at the Hackney Empire with 14 choruses taking part. It was at that time that we went from being a Gay Chorus to being a Lesbian and Gay chorus. We wanted to reach out because the Lesbian community and the Gay community in lots of ways were separated. […] By the time the festival happened, we were about 20 strong. So we were the first Lesbian and Gay Choir in Europe. We called the festival ‘Singing the Blues Away’, which of course implied fighting the Conversative (‘blue’) government’s plans to silence the LGBT community. The festival ended with a big benefit concert for the Terrence Higgins Trust at Sadler’s Wells, where Michael Cashman first announced the formation of a gay lobbying group called Stonewall. My favourite memories of that night are the massed choir of 500 voices singing Vera Lynn’s We’ll Meet Again and Gordon Kaye of TV’s “‘Allo ‘Allo” making his first public appearance after being outed by the Sunday newspapers. 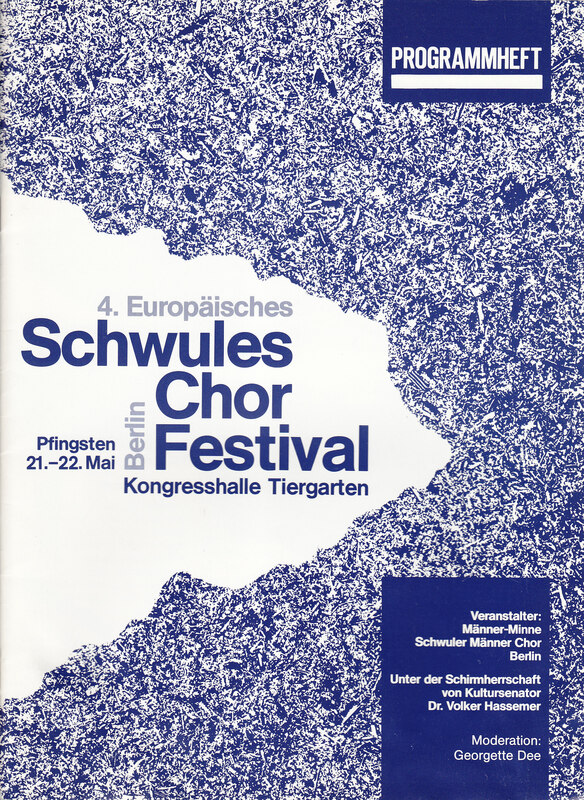 The European Festival of Song was renamed Various Voices in 1995 and London hosted the event again in 2009 at the Southbank Centre when over 60 choirs from across Europe took part. Twenty years had passed and in that time the UK choral movement had grown enormously.